Check out the video to see how our Monster 'Cake' is done. 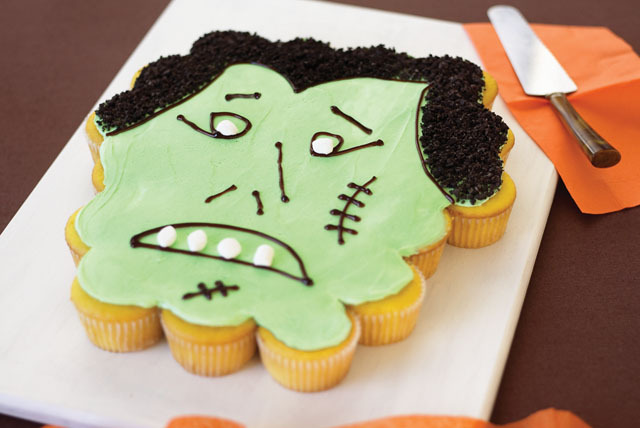 No specially shaped monster cake pan is required to make this Halloween showstopper; it's' just cupcakes in disguise! We're sorry for the trick, but enjoy the treat. Prepare cake batter and bake as directed on package for 24 cupcakes, blending dry pudding mix into batter before spooning into paper-lined cups. Cool completely. Beat cream cheese, butter, vanilla and food coloring in medium bowl with mixer until well blended. Gradually add sugar, beating well after each addition. Arrange cupcakes on platter or tray as shown in diagram to resemble a monter's head; spread with frosting. Use decorating gel to outline the eyes, mouth, scars and hairline on cupcakes. Fill in hair with cookie crumbs. Place 1 marshmallow half in center of each eye; place remaining marshmallow halves in mouth for teeth. Keep refrigerated. Let your imagination run wild and create your own unique cake. Just assemble the cupcakes into a shape, such as a ghost, jack-o'-lantern or witch face, then frost and decorate. It's easy!